Old City is a historic Philadelphia neighborhood bound by Vine Street to the north, Walnut Street to the south, the Delaware River to the east, and 7th Street to the west. The neighborhood is home to the Old City Historic District, which has the distinction of being listed on the National Register of Historic Places. 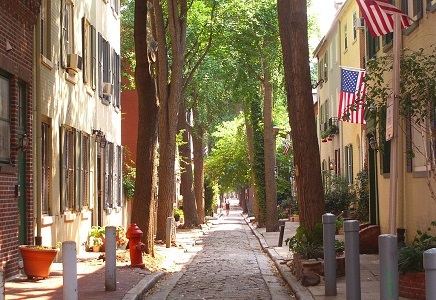 The Old City Historic District boasts cobblestone streets and rowhomes built in the late 1700’s and early 1800’s. Cultural institutions such as the National Constitution Center, Independence Hall, the Museum of the American Revolution, the Betsy Ross House, and the Liberty Bell are located in Old City. Old City is also known for its restaurants and nightlife. Acclaimed restaurants such as High Street On Market, Zahav, Farmicia, Cuba Libre, and Amada are just a few of Old City’s many eateries. Residents can also enjoy a walk along the Delaware River at Penn’s Landing, which also hosts the Spruce Street Harbor Park pop-up park during the summer months. The median sales price for a home in Old City is $331,800 with a price per square foot of $376. The median rent price is $1,795.